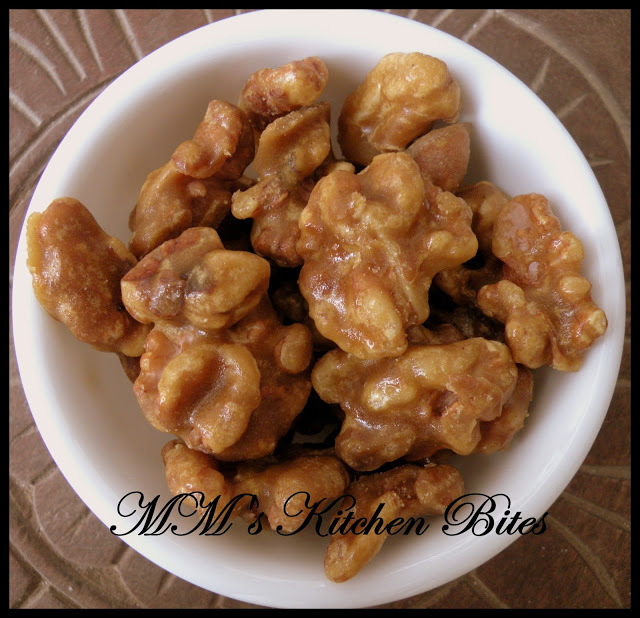 Dry roast the walnuts in a non stick kadhai/microwave oven and let cool. Melt gur in a non stitck pan on a low flame and let it come to a boil. You will know it’s done once it kind of starts pulling away from the edges. Add Walnuts and mix well for a couple of minutes till the gur has coated the walnuts completely on all sides and all nooks & crannies. Pick up the walnuts with a spoon (one by one, and you will have to work fast) and place on tray lined with foil. 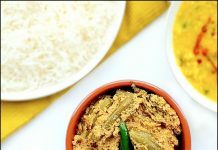 If the mixture in the pan becomes hard in the meanwhile, reheat again at a low flame. Let them cool and store in an airtight container in the fridge. 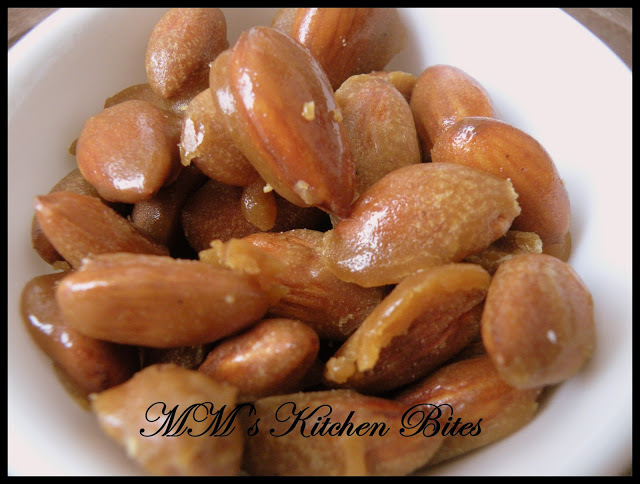 Dry roast the almonds in a non stick kadhai/microwave oven and let cool. Melt gur in a non stick pan on a low flame with the water and oil and let it come to a boil. You will know it’s done once it kind of starts pulling away from the edges. Add the almonds and mix well for a couple of minutes till the gur has coated the almonds completely. Pick up the almonds with a spoon (one by one, and you will have to work fast) and place on tray lined with foil. 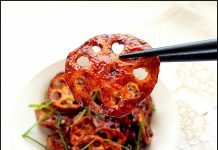 If the mixture in the pan becomes hard in the meanwhile, reheat again at a low flame. Let them cool and store in an airtight container in the fridge. Previous articleChole….let the weekend begin!! Sounds good, will try this for sure.. The almonds lost their crunch on coating with jaggery and I had to add water and oil to the jaggery to bring it to coating consistency to coat walnuts and so they are a little wet to touch even after cooling. Please suggest how to make them better. 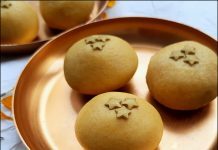 I tried them but the almonds lost their crunch on coating with jaggery and the jaggery would not melt to the consistency of coating the walnuts so I had to add oil and water to it. The walnuts are fine but a little wet to touch. Please suggest how to make them perfect.